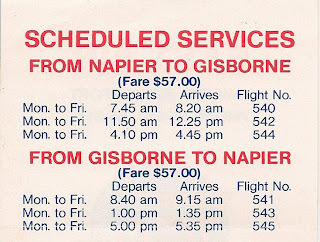 In April 1984 East Air Limited applied to the Air Licensing Authority for a Category B air transport licence to provide an air transport service from Napier to Gisborne and return with a fleet of one Piper Pa31-350 Chieftain, one Piper Pa31-325 Navajo or one Cessna 402B aircraft. Pilots included manager and chief pilot Allan Klenner and Jim Tait. Gary Peacock (owner of Air Napier) was company secretary and Maurice Dempsey the Marketing Manager. The service started a week later than first anticipated on the 16th of April 1984 with Piper Pa31-310 Navajo ZK-DCE (c/n 31-261) flying the first service with Cessna 402B ZK-DSG (c/ 402B0559) arriving in Napier shortly after. As well as the Navajo and Cessna 402 the airline leased Partenavia P.68B ZK-NMK (c/n 114) in the first few months. The service initially operated under a temporary licence before becoming the first completely new company to commence operations under the 'deregulation' of air transport. Initially three return flights were flown each weekday, this later being reduced to two flights each weekday. Later in the year Piper Pa31-350 Chieftain ZK-EVD (c/n 31-7405241) replaced the Navajo and Partenavia. 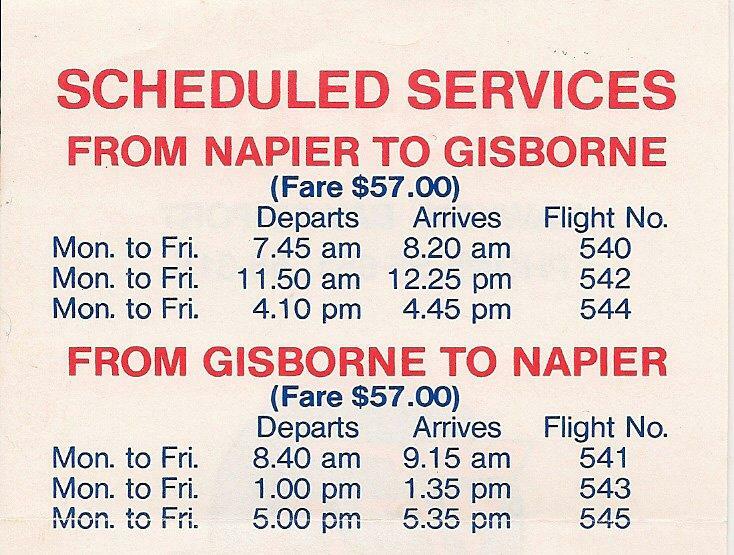 From the 1st of October 1984 East Air extended its services to include a Gisborne-Rotorua sector. One of the features of East Air’s service was that the airline offered fruit juice and a snack of biscuits or cakes. As well as expanding to the west the company also had the opportunity to expand to the east to the Chatham Islands. After working on the Chathams flying crayfish for various operations Craig and Judy Emeny decided to form their own Chatham Island based operation by purchasing a Cessna 337F Skymaster ZK-TAI (c/n 337-01456) from Air Rarotonga in November 1984. The aircraft was flown by Craig Emeny and operated under East Air’s licence. The aircraft made its first flight to the Chathams from Christchurch on the 8th of November. On the 10th it made a return trip to Gisborne and on the 11th it made its first flight to Napier. Meanwhile East Air saw the potential for an air service to the Chatham Islands and launched their own regular twice weekly passenger and cargo air service from Napier on the 18th of February 1985. The following month, in March 1985, Air Chathams obtained its own licence and started operating unscheduled charter flights in its own right with the Cessna 337. These were focussed on the carriage of crayfish to the mainland but also included other charter flights to and from the Chathams. Rather than being in competition with East other Air Chathams and East Air had a co-operative arrangement until East Air subsequently folded. Cessa 337 ZK-TAI was operated under East Air's licence by Craig Emeny before the formation of Air Chathams. It is seen here on maintenance at Hastings of 20 February 1985. Late in 1985 East Air sought approval from the Air Services Licensing Authority for further expansion, applying to conduct a Category "A" air transport service to and from the Chatham Islands from Auckland, Napier, Wellington and Christchurch using a Hawker Siddeley 748 as well as adding New Plymouth to their Napier, Gisborne, Rotorua service. East Air was keen to promote tourism to the Chathams in conjunction with a new lodge being built there and it suggested to Government authorities that it might be able offer an unsubsidised service to the Chathams with the larger Hawker Siddeley 748, but also acknowledging there wasn’t room for Safe Air and East Air operating two large aircraft to the Chathams.